Weighing 652 lb, COMPOSILITE(TM) FBC(TM) features in-line air spring design and offers 28Â° turning radius for maneuverability. It mounts in 23.5 in. packaging space to facilitate multi-axle configurations and accommodates 6-hole hubs for use with 17.5 in. tires. 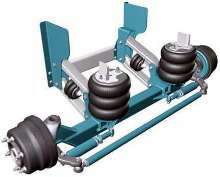 Beams and lift plates remain parallel, ensuring proper wheel tracking and extending air spring life. Stabilizer uses cover to protect stabilizing rod from dirt and debris throughout travel. HEBRON, Ohio - Hendrickson recently expanded the COMPOSILITE(TM) family with the launch of COMPOSILITE FBC(TM), an 8,000-pound capacity, self-steering auxiliary lift axle. Delivering the advantages haulers value in the COMPOSILITE family, from helping to stretch their vehicles' life span to reducing maintenance, the FBC proves a superior choice for fleets and owner operators who do not need a full 13,500-pound capacity lift axle for their federal bridge compliance efforts. Weighing only 652 pounds, COMPOSILITE FBC maintains the durability and features of the COMPOSILITE ST by delivering outstanding maneuverability with the industry-leading, 28-degree turning radius. A unique in-line air spring design provides maximized packaging space. All COMPOSILITE lift axles mount in 23.5-inch packaging space allowing easier multi-axle configurations. "Today's vocational market demands innovative durable products that deliver superior functionality combined with maximum weight savings," reports Mike Gottschalk, director of engineering and operations of Hendrickson Auxiliary Axle Systems. "Lighter trucks mean more payload for increased efficiency, and that's what the COMPOSILITE FBC does for today's truck operator." COMPOSILITE FBC accommodates six-hole hubs for use with 17.5-inch tires. With rims and tires, the FBC weighs in at only 836 pounds. COMPOSILITE FBC can be ordered with an integrated air system that reduces installation time through a pre-located air tank, hoses and valves. COMPOSILITE FBC was designed to assist fleets and operators to lower life cycle costs. The beams remain parallel to ensure proper wheel tracking and help enhance tire life, while lift plates remain parallel for longer air spring life. The stabilizer uses a cover to protect the stabilizing rod from dirt and debris throughout travel. For additional information about the COMPOSILITE family or any Hendrickson lift axle, contact Hendrickson Auxiliary Axle Systems, Hebron, Ohio, toll free at 800-660-2829 or 800-660-2843. Hendrickson International is one of the largest global suppliers of truck and tractor suspensions, trailer suspensions, truck and trailer lift axles, springs and bumpers to the commercial transportation industry. Headquartered in Woodridge, Ill., Hendrickson has been meeting the needs of the transportation industry for more than 90 years. Visit the Hendrickson website at www.hendrickson-intl.com.